Home > Lectures > "A Legacy of Love and Learning"
"A Legacy of Love and Learning"
On Oct. 2, 2018, the University of San Diego and the Society of the Sacred Heart celebrated the bicentennial of St. Rose Philippine Duchesne's arrival in the United States. The following lecture was delivered by Carolyn Osiek, RSCJ, for the occasion. Two hundred years ago today, in Saint Charles, Missouri, Philippine Duchesne and her four companions, Eugenie Audé, Octavie Berthold, Catherine Lamarre, and Marguerite Manteau, were awaiting the arrival of their first three boarding students the next day. They had crossed the wintry Atlantic, including 52 days at sea with no sight of land. They had landed in tropical New Orleans, encountered new cultures, and recovered for six weeks from the sea voyage. They had then spent forty days on the steamboat Franklin up the Mississippi River to St. Louis, and spent two weeks there in the home of the Prattes, a leading local family. Then on September 7 they had been taken by coach and ferryboat across the Missouri River to Saint Charles to begin on September 14 the first school of the Sacred Heart in the New World. Now they were preparing to receive three girls, Emilie and Therese Pratte, daughters of their hosts in Saint Louis, and their cousin Pélagie Chouteau, to begin the boarding school on October 3. Meanwhile, Mission San Diego de Alcalà had been founded on Presidio Hill in 1769, and moved in 1774 to its present location. By 1818, there were about 600 resident settlers. Both British and American ships had already visited. We say that Philippine opened in St. Charles, Missouri the first free school west of the Mississippi. But here, Manuel de Vargas, pioneer school teacher, opened the first public school in 1795. I have inquired of the San Diego History Museum whether his school was free or with tuition, but have received no response. It could well be that he opened the first free school west of the Mississippi—way west of the Mississippi! We are here today because of Philippine and her four companions, and because of people like Rosalie Hill, Bishop Buddy, Aimee Rossi, Nancy Morris, Author Hughes, Sally Furay, Gina Rodee, and so many others, to celebrate a tradition of education that has endured by holding on to the essentials and at the same time adapting to a changing world. Philippine arrived with the expectations of her French upbringing. According to the social system of her time, the day school was intended for the more economically modest classes, with free basic education appropriate to social expectations, while the paying boarding school was for the well-to-do, where the religious could bring the best of the European culture that had survived the throes of the Revolution in France. But already in the first year at Saint Charles, they introduced a new wrinkle in the system, not unknown in France but still steadily resisted: a paying day school as well, an adaptation for the rising middle class who did not want the full boarding experience for their daughters, but still wanted the best that money could buy. Already in the first year, adjustments were made. For those who may not be familiar with the life of Philippine, a brief sketch. Born in Grenoble, France, on August 29, 1769. Rose Philippine Duchesne was the second of eight children of Pierre-François Duchesne, a prosperous and politically active leading citizen of the haute bourgeoisie of Grenoble. At the age of three, little Rose Philippine had smallpox that lightly scarred her face for life. When she was nine years old, her older sister Marie-Adelaide died at the age of eleven, leaving Philippine as the oldest of six girls and one boy. As was customary for children of her class, she was privately tutored at home, along with her cousin Josephine Perier, who would be her lifelong best friend. The two of them were sent together to convent boarding school at the age of twelve, the usual age to prepare for First Communion. Sainte-Marie d’en Haut, the convent of the Visitation at Grenoble, founded by Saint Jane Frances de Chantal herself, rose above the city, halfway up a mountain. In her few short, happy years there, Philippine was strongly attracted to religious life. When her family learned of it, they abruptly withdrew her from the school. She returned home for the next step of the education expected of her: acquisition of the social skills of art, dancing, and music, in preparation for marriage. One of her sisters later recalled that Philippine went about learning to dance with the same concentration that she went about learning algebra! However, Philippine was firm in her decision that she would be a nun. Some of you know the story: one day in 1788, when she was eighteen or nineteen, Philippine invited an aunt to go with her to visit the nuns up the hill at the Visitation convent. Once there, she declared that she was staying. Her family came to dissuade her, to no avail. There she stayed until the convent was closed and the nuns dispersed in the first years of the Revolution. In 1788, the same year in which Philippine entered the Visitation convent, the king’s government attempted to dissolve the Parlement, the court of justice of Dauphiny, located in Grenoble. What followed was a meeting of the Estates General of Dauphiny, July 21, 1788, at the château of Vizille, the country home of Philippine’s uncle, Claude Perier. The second meeting was held at Romans on September 9. These two meetings launched the Revolution. Philippine’s father, Pierre François Duchesne, was present at the first meeting, but skipped the second in order to attend her reception of the habit as a novice of the Visitation at Sainte Marie in Grenoble. Nevertheless, he would not later consent to her making vows, so she remained a novice for four and a half years (the usual time is two), until September 1792, when all convents were closed and the religious dispersed to their families, or wherever they could go. Philippine was forced to return to her family. She engaged in whatever social needs there were, helping the poor and suffering, especially visiting imprisoned priests at the risk of her own safety, though she was never arrested. When her family withdrew to their country house in Grâne, about 60 miles away, she went with them for a time, and tried to live some kind of religious life there. She returned to Grenoble after the worst of the Revolution, looked around, and saw the need for someone to take charge of the instruction of street boys, who wandered uncared for. She gathered them, fed them, won their confidence, and instructed them in religion. It embarrassed her family no end when she walked with them in the streets and the urchins along the way all waved and called out to her. During these years of uncertainty, she searched earnestly to find the will of God for her, and had the inspiration to try to re-assemble the previous Visitation community in the convent in which she had lived. Through her family connections, the old monastery was turned over to her and she moved in on a rainy December day in 1801, with the help of her street boys who carried her few belongings. She later remarked proudly that they didn’t steal a thing! She got the word out to the former Visitation community to come back. It had been eleven years. The house had been used as a hospital and then a prison. Repairs were badly needed. Some of its former community came and tried, but the plan came to nothing. They left her alone with a few other women who were also looking for religious life. Gossip went wild in the city: who did she think she was? She was so demanding that no one could get along with her! This was a very important time in Philippine’s life, young adulthood, in her 20s, the time of life when character is formed and life directions are still fluid. She was left with an empty old building and the support of a few priests and women friends. Where to go from here? After several years of trial and frustration, the answer came finally in the person of Madeleine Sophie Barat, superior of a newly-founded group called the Ladies of Christian Instruction, unable yet to call themselves by the name of Sacred Heart as they wished because of the fragile political situation. Through the mutual acquaintance of several priests, a connection was made. Philippine wanted Madeleine Sophie to come tomorrow. But again, more waiting: it was six months before they met. The meeting of the two saints took place in Grenoble on December 13, 1804, one day after Madeleine Sophie’s 25th birthday and eleven days after Napoleon crowned himself emperor at Notre Dame Cathedral in Paris. As Sophie and her two traveling companions neared the door of the monastery, there was a flurry of motion, and suddenly Philippine was at her feet mumbling something about feet on a mountain. It was Isa 52:7: How beautiful upon the mountain are the feet of the one who brings good news! Sophie told the story years later, and said she was so astonished, she let her do it! Philippine was ten years older than Sophie, of the haute bourgeoisie, whereas Sophie was the daughter of a country vintner, but Sophie had had a marvelous education directed by her older brother. Philippine immediately put herself under Sophie’s spiritual leadership, so eager was she for a wise spiritual guide. The encounter with Madeleine Sophie Barat was the beginning of a new future for Philippine, just as the accession of Napoleon began a new if brief era of stability for France. After a year of novitiate, Philippine pronounced her vows on November 21, 1805. She was finally home. But within two months, by early the next year, 1806, home was no longer enough. Philippine expressed to Sophie her desire to be a missionary in foreign lands. Even as a child, she had already been entranced by the stories of former missionaries. But she had a dilemma: she wanted two things that were mutually incompatible. She loved her monastery of Sainte Marie in Grenoble. She had suffered much to acquire it. She also longed to spread the good news of Christ in new and unknown regions. She could not have both. So as she later wrote, on the morning of January 10, 1806, while meditating on the detachment of the Magi from their homeland to follow the star, she made the sacrifice of Sainte Marie in order to pursue her dream of mission. But it was not to happen for another twelve years. Twelve more years of waiting, while Philippine peppered her superior Sophie with possibilities of missionary ventures. Sophie admitted her own dream of going on mission and the impossibility of ever fulfilling it. “I am nailed to France,” she wrote. She told Philippine of her hope that she, Philippine, would someday carry it out for her. In 1815, Philippine left Grenoble to take up residence in Paris at the motherhouse as secretary general. Now she had Sophie’s ear directly, and continued to agitate to be sent to foreign lands. Yet the superior general continued to refuse permission when Philippine presented her with various proposals. Then came the newly ordained Bishop Louis William Dubourg, bishop of “Louisiana,” that is, all of the Louisiana Territory—what is today the entire central United States. He had spent nearly two years traveling in France and Belgium recruiting priests and seminarians for his new diocese, hoping, too, to have some women religious. Sophie’s brother Louis had encouraged Dubourg to seek out Philippine, knowing of her missionary desires. Sophie steadfastly refused him until his final visit to the motherhouse in Paris on May 17, 1817. He was going to leave empty-handed, until Philippine knelt before her superior and begged Sophie to give consent. She did, and as we say, the rest is history. Not an easy history, however. The long wait of six weeks at Bordeaux before they could sail, after they had made the sacrifice and left everything behind in Paris; the long voyage of more than two months, including fifty-two days at sea with no sight of land; six weeks of recovery in New Orleans, followed by a forty-day river voyage to Saint Louis; the disappointment of being placed in the outpost of Saint Charles instead of the thriving trade center of Saint Louis; the cold and deprivation of the first winter, followed by a move once again, to Florissant, at the insistence of Bishop Dubourg; the splitting up of the community only three years later in 1821 to make a new foundation at Grand Coteau, Louisiana, and so much more. Philippine had made her decision for life and would not return to France, even though it was not unusual; Bishop Dubourg’s sister had made the crossing six times, and many of the French missionaries who came to his diocese eventually did return to France. Philippine had two invitations to return: once in 1833 when her cousin Josephine offered to pay her way. She declined, saying that she would prefer to die working. The other was an invitation from Sophie herself in 1838: “At least then we would see each other again,” Sophie wrote. As far as we know, Philippine did not even comment on that offer. By that time, her gaze was fixed on the new project that was forming with the Jesuit mission to the Potawatomi Native Americans in Kansas. Philippine had believed at her departure from France in 1818 that she was coming to America to be with the Native Americans, and she was allowed to keep that belief until she arrived. But in fact, by the time she came to Saint Louis, the Native Americans had been pushed farther west. Only much later, in 1841, when Bishop Dubourg was long dead, did she complain that she had been deceived by him, as she argued then to be included in the new mission to the Potawatomi at Sugar Creek, Kansas. It took the conviction of the Jesuit leader, Father Peter Verhaegen, that at the age of seventy-one and in poor health, she was included in the band of four religious who set out for Kansas on June 29, 1841. From early on, Philippine’s focus was on the frontier, with what I would call a spiritual restlessness, ever yearning for the new and unexplored, but always in order to reveal the love of God to others. Two months later, this desire is still with her. To Madeleine Sophie from Florissant, on August 15, 1821, she writes: “When I arrived here, I thought I had no more ambition, but I feel eaten up by Peru. But these desires are quieter than those in France that so disturbed you. “ Through all the years that followed, years of disappointment, frustration, and small successes, years in which she considered herself a failure, she never gave up on her original desire: to live and minister among the Native Americans. I am assured that the cemetery contains the bodies of saints; so in my solitary walks that end there, on my knees I beg for the happiness of joining my bones to theirs. However, I experience the same desires for the mission to the Rocky Mountains, or something similar, as those I had in France for coming to America and then once here for the land of the Indians. They say that in the Rockies, they live to be a hundred. As my health has been restored, and being only seventy-three, I think I would have at least ten more years of work. When I first desired to go to America, I thought only of Canada. That was the goal of all my hope….But Father Barat told me Canada had what was needed and he offered us to Bishop Dubourg, who placed us near Saint Louis. So I thought no more about Canada and I think the Divine Goodness for having sent there others more fervent than I.
Philippine was deeply wounded by the closing of her two most beloved houses during her lifetime. The first was Sainte Marie in Grenoble, France, where she had first entered the Visitation Order, tried to restore the convent as it had been before the Revolution, first met Madeleine Sophie Barat, lived for a year under her direction. The house was closed in 1833 when the French government repossessed it. Philippine did resist change, when it meant having to give up something she loved. She found herself often suspended between what she had cherished in the past and the uncertainty that lay before her. Sometimes she was energized by her dreams for a future in which she would be immersed in the effort to give the love of Jesus to those who did not know him. At other times, she was devastated by changes in her immediate world that she wanted to remain familiar and stable, even as it was changing all around her. Let’s be careful not to romanticize Philippine: she is the last one who would want that. She was a product of the ancien régime who did not take to these new ideas about democracy and would have had no sympathy for the revolutionary movements rocking her country, with which her father, uncle, and cousins were deeply involved. Anyone who criticized the authority of church leaders would have found no support from her; she remained ever loyal to religious authority even though she suffered deeply from the abusive use of clerical power on the part of priests and a bishop. Though she was at first astonished by the existence of slavery in the states where she lived, Missouri and Louisiana, she soon found that part of living there meant that she had to adapt to it and live with it, and so we have records of enslaved persons in the houses that she governed, but she frequently also raised the desire to educate children of color and admit women of color to religious life. Nevertheless, she picked up some of the prejudices of white society. She was critical of white Americans, too, for their moral dissipation, lack of seriousness, and obsession with equality—so different from the tiered society from which she had come. She was no admirer of Native American culture, either, finding the Native Americans she encountered improvident and addicted to alcohol. Bringing the Gospel to them meant bringing civilization, and civilization was French Catholicism. These are some of the shortcomings of the historical person we remember. She wasn’t perfect: far from it, though we must be careful about judging anyone from the past by the norms of today. Philippine took what she believed to be the best of her day and ached to communicate it to those whom she felt needed it, those poor and excluded from the mainstream, especially the Native Americans, whose culture was being destroyed around them. Throughout her life on the frontier, she gravitated to the poor, the defenseless, the vulnerable. One of her biographers, Catherine Mooney, noticed that wherever Philippine lived, the boarding school did not prosper, as it did in the two large Louisiana schools, but the free school for the poor flourished. She took the initiative to leave behind everything that was dear to her to cross an ocean and spend the rest of her life, thirty-four years, at the edge of a world she knew but that was changing more rapidly than she could keep up with. She crossed the frontiers of her day, driven by the desire to communicate the love of God that she had experienced. Two hundred years later, we celebrate the courage that brought her here and wonder whether we would have had the strength and sheer guts to do what she did. As I look at her life, which I have been doing in intense detail through the editing of her writings for about the last ten years, what I see is a person deeply, sentimentally attached to many things of the past, but when it came to a choice between past and future, she always chose the future. I think in this, she lived the spirit of the Society of the Sacred Heart and its education. We celebrate a legacy that has brought us to where we are today. “Crossing frontiers” has been the theme of the bicentennial year, taking its cue from the first priority of the Society of the Sacred Heart General Chapter of 2016: “To reach new frontiers.” –not only reaching them but crossing them! Here at USD, you know something about frontiers: an international border fraught with pain and tension and an ocean that both separates and links us to other worlds. The frontiers that we can even imagine today will be gone tomorrow, giving way to others now beyond our imagination. The jobs and social roles for which we educate young people today will be gone before they reach middle age. The jobs and roles of the future do not yet exist. Whereas in Philippine’s life change could be measured in years, today it is measured in seconds. These are goals that are not so bad for a well-rounded Catholic university education either. A personal and active faith in God: something USD hopes all students, whether Catholic or not, will acquire and nurture, with many resources provided to nourish and develop spiritual life, from liturgical celebrations to seminars to retreats. A deep respect for Intellectual values: with the whole tradition of the Catholic university and the legacy of Sacred Heart education at the base, the cherishing of intellectual values is at the core of the university experience. Critical thinking is the top skill that a liberal arts education hopes to teach. A social awareness that impels to action: USD as a Changemaker campus seeks to develop in all members of the campus community an active sense of responsibility to bring needed change to our world. The building of community as a Christian value: the residential presence for first and second year students, the Living-Learning Communities, and the many social activities and events on campus aim to foster a true sense of community. Personal growth in an atmosphere of wise freedom: an essential element of the transition from adolescence to adulthood is growth in self-knowledge and ability to make life decisions wisely. What are some of the specific ways in which USD lives this legacy of loving and doing justice? The Micah Fellows Program, Do Justice, Love Mercy, Walk Humbly is a partnership between USD and St. Mary’s College, supported by Karen and Tom Mulvaney. It is a living/learning fellowship that challenges participants to creatively examine and practice community, leadership, simplicity, social justice, and spirituality, meeting communities where they confront challenges and seek to grow in opportunities. In New Orleans, USD partners with the Society of the Sacred Heart’s Duchesne House to co-create traveling seminars for students, staff, and community partners to examine the intersectional identities of race, class, gender, political beliefs, and social justice issues in cities like New Orleans and San Diego. The community becomes the teacher, including RSCJ, helping to cultivate engaged citizenship among USD’s students to build a more democratic society for the common good. The Mulvaney Center, celebrating its 30th Anniversary this year, begun by Sr. Sally Furay, represents an enduring achievement of the Society’s legacy at USD. The Mulvaney Center integrates its work with diversity and inclusion efforts, as well as the social innovation of the Changemaker HUB, to create compassionate, holistic experiences where the wisdom of communities is valued, and dynamic ways that communities meet challenges are held as learning opportunities for USD students. Sometimes we hear laments from spiritual writers who are trying to make sense of it all. Some bemoan lost innocence, thinking that there was a previous time, even within living memory, in which life was simpler, less complicated, and didn’t move at such a pace, when we were more connected to the earth and could live more naturally. In such a remembered world, there was a commonly shared cohesive narrative, a common story that provided shared meaning. Many of us here are old enough to remember what we think was such a time. It’s the story of the Garden of Eden reinterpreted. There is certainly some truth in it. Life before internet, Facebook, and Twitter moved more slowly. There were fewer complications to face each day, or at least, we could face them more slowly. But were there really fewer complications? Poverty, racism, and intolerance were not only tolerated but widely allowed to continue unchecked, with sometimes deadly consequences for those who would question the distribution of power. There are also so-called “traditional cultures” still alive today that more strongly uphold community values and coherence, a simpler lifestyle, and less dependence on technology. Such cultures also often have flagrant disrespect for human rights and are usually rigid enforcers of conformity and ruthless suppressors of anyone who dares act outside the norm, including minorities in the population. We are familiar with some of the attempts in the Western world to return to such mythic origins, but this is not limited to the West. The rise of the so-called Islamic State, and its ability to attract and retain sincere religious Muslims, is another example of the appeal to a desire to return to a golden age, in this case of Islam, however misguided and off track some of that movement is. I am not suggesting that the way of living in which we find ourselves today is better or worse. What I am saying is that there never was a golden age when everything was better. There is no going back to a perfect time, even though we might long for it. When doing research on the history of the family as a social institution, I became aware that in just about every generation, there is some kind of lament about losing the “good old days,” which usually means the immediately previous generation. One of my favorites is the early second-century Roman historian Tacitus who complains that in the good old days women stayed home and took care of their own children, but now they don’t do that anymore. Education must be for the future. The trouble is, we don’t really know how to do that because change is happening at such a speed that we don’t know what the future will be like. Science is bringing change faster than our bodies and our consciousness can absorb. The generation now in college is being called Generation Z. They are the first generation that has never known a world without internet and smartphones. Some characteristics noticed by researchers include a tendency to delay transition from adolescence to adulthood, i.e., postponing moving away from home or even getting a driver’s license. They are less independent and self-confident than their predecessors. Their attention span is approximately eight seconds. They are tolerant of diversity and intolerant of intolerance. Researchers know that technology and instant reward are changing the structure of the brains of young people, but we don’t yet know exactly how and it is still too early to know how this will play out later in their adult lives. All of this will be a part of what we face for the future as we move into a world that is yet to be. We remember and celebrate the past as a springboard to the future. The grain of wheat dies and becomes a new life that we could not have dreamed. Our education today must be broad enough to embrace global realities, to aim for the stars while learning how to bring everyone along on the journey. Only love can do that. If we fall short in learning, we can relearn and try again. If we fall short in love, the right moment will be gone, and we will have missed the point. The tradition of Sacred Heart education, brought to us by Philippine and so many others since then, is alive and well. We carry it in our hearts and we live it at the University of San Diego. Gary Robbins, San Diego Union-Tribune, September 2, 2018. Sts. Madeline Sophie Barat and Rose Philippine Duchesne. 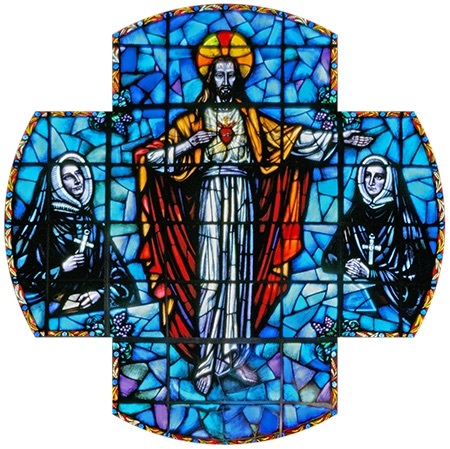 Stained glass from The Immaculata at USD.